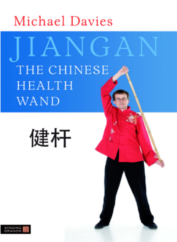 `Search for the Hatchet’ is one of the more challenging Chinese Wand Exercises. 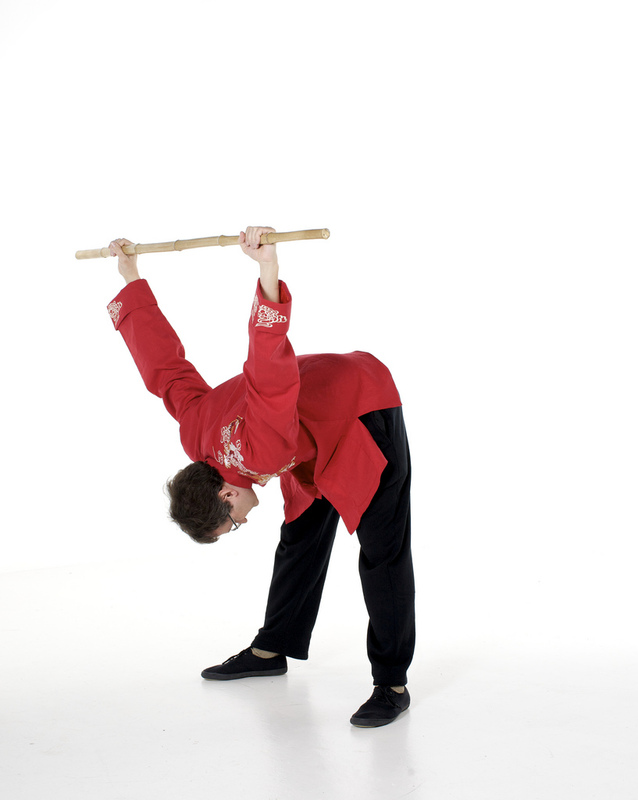 It involves bending forwards and raising the arms behind us as we hold the wand behind the back either side of the body. There is a style of Chinese Wand in Taiwan that has an identical technique. However, their wands are shorter which makes the posture a little more challenging. 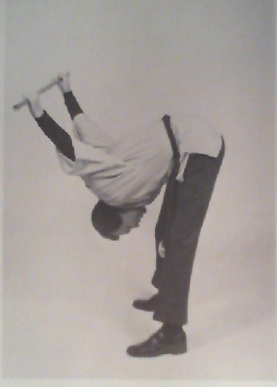 This posture is one of many presented by Bruce Johnson in his original book which also feature in exercises in China and Taiwan today. To assist those learning from written text (both my book and blog) I am producing brief tutorials that go over the main points of each of the exercises. Today it is the fourth exercise; Twisting the Snake. This tutorial is about the fourth exercise, Twisting the Snake. This is a wonderful exercise for those of you with stiff and sore joints of the arms and shoulders. It allows a full range of motion and stimulates circulation in these areas by the steady and gentle weaving motions of the wand as it circles its way completely around the upper body. The exercise is performed slowly and smoothly with no pauses – but for the sake of this video I will pause at each stage. 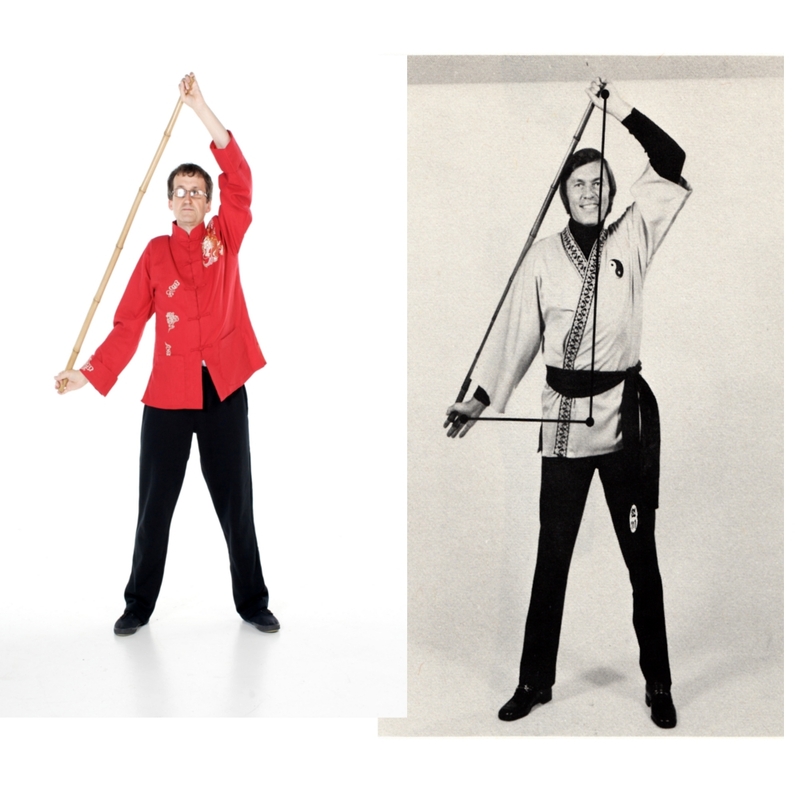 In the starting stage, stand erect, feet in a medium stance, holding the wand with a wide grip straight out in front of you at shoulder height. In stage one, swing your right arm up and around towards your left, raising it so your right hand goes up and over the top of your head. Continue moving the wand around behind you, touching your neck briefly, inhaling deeply as you do this sequence. Keeping the wand moving, roll it around off your neck, continuing to bring it back to the starting stage, by now raising your left arm up and bringing your left hand up and over your head towards the right, and bringing the wand back straight out in front of you, in the starting stage, while exhaling fully. Repeat the process, leading with the left hand, inhaling as you bring the wand around to the right side of your head, then exhaling as you bring the wand around to your left side, using the right hand to place the wand back to the starting stage. In stage two, roll the wand around your shoulders. In stage three, bring the wand down to briefly touch the upper shoulder blades. In stage four, bring the wand down, close to the body, to briefly touch the middle back. In stage five, bring the wand down, close to the body, to lightly touch the lower back area. In the final stage bring the wand down, close to the body, as far as it will go, with the arms straight. Pause briefly to stretch the arms down. Repeat this final stage, eliminating the other stages, as many times as you feel able. To assist those learning from written text (both my book and blog) I am producing brief tutorials that go over the main points of each of the exercises. Today it is the third exercise; Peeling the Octopus. This tutorial is about the third exercise, Peeling the Octopus. This exercise is excellent for those with arthritis in the arms, neck, shoulders or upper body – and for those with stiffness or soreness in any of these joints. It is one of the finest exercises for improving the posture. The exercise is performed slowly and smoothly with no pauses – but for the sake of this video I will pause at each stage. In the starting position, stand erect, legs straight, knees only very slightly bent, feet in medium wide stance. Hold the wand overhead in a wide grip, positioned in a straight line up from the back of your neck. Before you get to this position, you may want to begin with the wand against your chest and gradually work your way up to this position, exhaling when you raise the wand and inhaling when you lower the wand, until the wand is in the starting position. In stage one, bring the wand down just above the back of your head, inhaling deeply. Then raise the wand back to the starting stage, exhaling fully. Stretch your arms to the fullest extent, straightening your arms, with no bend in your elbows whatsoever. Every time you return to this starting stage raise the wand as high as you can. In stage two, bring the wand down to touch the back of your neck, inhaling deeply. Then raise the wand back to the starting stage, exhaling fully. In stage three, bring the wand down to touch the back of your shoulders. In stage four, bring the wand down to touch your shoulder blades. You must release your grip a little on the wand. In stage five, bring the wand down to your lower back, now holding the wand by thumb and forefingers. In the final stage, bring the wand down to touch the upper middle part of your buttocks. Again hold the wand by thumb and forefingers. Straighten your arms and really stretch down as far as you can. Then go from the final stage to the beginning stage and final stage again – eliminating the stages between. Do as many repetitions as you can. Only move your arms. Keep the rest of the body still. Make sure you keep the wand close to your body. Keep the wand in a straight line with the back of the shoulders and do not move it forwards over the head. The feeling should be of being pulled upwards as you reach into the clouds and pushing the wand into the centre of the earth. The photos below of myself and Bruce Johnson show a particular stage of the Twisting Snake posture. Our right arms are straight and extended downwards, left arms bent, holding the left end of the wand above our heads. If the wand is too long the left hand would be straight and stretch too high in this position, if too short the hand would be too close to the head; or the right arm would have be bent (remembering that the wand must be held at the ends). So the movements would be more awkward and not as beneficial if performed with longer or shorter wands. There is some leeway – the photos are not exect – but the photos show the general position of the arms. To assist those learning from written text (both my book and blog) I am producing brief tutorials that go over the main points of each of the exercises. Today it is the second exercise; Sunrise & Sunset. This tutorial is about the second exercise, Sunrise and Sunset. This exercise is the second warm up (after Stretching the Crane) – and is considered to be close to the perfect exercise. It warms up and engages most muscles of the body. We start at the beginning posture with the feet in a wide stance, the wand held overhead in a straight line from your nose. Rise up on your toes, raising the wand as high as you can and inhale deeply. In stage one you come down from your toes as you exhale fully, resting the wand in front of your neck. Then rise up on your toes again, raising the wand as high as you can while inhaling deeply. In stage two you come down from your toes as you exhale fully, bringing the wand down close to your body to come to rest in front of your chest. Bend your knees slightly. In stage three the wand reaches the navel area as you reach a half-seated position. Bend the knees a little more but keep the back straight. In stage four the wand reaches the lower hip area. You are return to the half-seated position. Bend the knees a little more but keep the back straight. In stage five the wand reaches the top of your thighs, in the half-seated position. Bend the knees but keep the back straight. In the final stage, the wand reaches a few inches below the top of your thighs. You are in a half-seated position with knees bent but the back is straight. Now repeat the movements, missing out the stages, going from the beginning to final stage, repeating as many times as you feel comfortable. There are no set repetitions. Keep the wand close to the body. The most important thing to remember about this exercise is that we must never bend forwards or slouch. Stand straight and erect at all times. 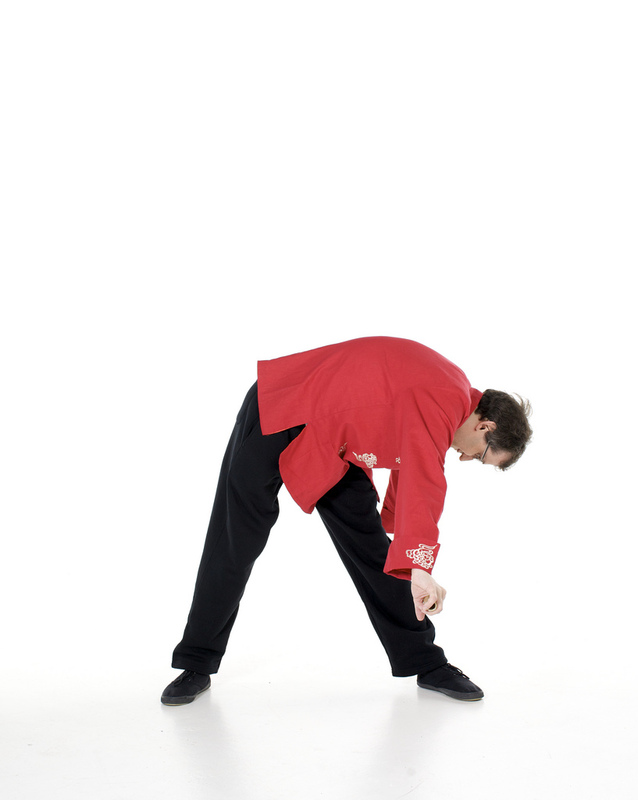 If you find it difficult to know if you are standing straight, try to arch your back very slightly backwards. Imagine yourself balancing a glass of water on your head. Picture yourself standing against a wall, your buttocks and head touching the wall and maintaining contact as they slide up and down the wall. If you are incapable of performing the stages as shown in this video, only do the stages that meet your capabilities. This exercise is the most comprehensive of the whole routine. The wand and the body are both kept in constant flowing motion, which causes energy to flow from the base of the spine to the top of the head. Energy keeps flowing up and down as you raise and lower the wand. Inhale deeply as you rise onto your toes, exhale fully as you come down from your toes. To assist those learning from written text (both my book and blog) I am producing brief tutorials that go over the main points of each of the exercises. I start with the first exercise; Stretching the Crane. This tutorial is about the first exercise, Stretching the Crane. It is the only one out of the 17 exercises not to use the wand. This posture has two parts. Part one. Stand with feet wide apart. Inhale. Raise up onto your toes. Stretch your arms up and out to your sides. Tilt your head back. Arch your back slightly. Stretch your arms back behind your body as far as you can.Part two Exhale. Roll down off your toes to a flat-footed position. Bring your arms in front of you, palms together. Bend over and swing your hands down between your legs. Do not bend too far. Your knees should be only slightly bent, so that your hands do not do sink beyond your knees. maintain a smooth and comfortable rhythm and do not go not too fast. Repeat about nine or ten times.That is the basic method. Now if you have trouble standing on your toes, transfer your weight to the front of your feet, then gradually try to stand on your in toes in subsequent practices. If you are a little stiff you may also employ a gradual approach to this exercise, beginning with small movements than gradually stretching and bending further each time. This wonderful warm-up exercise stimulates the muscles and gets the circulation going throughout the body. This exercise imitates the stretching of the wings of a giant bird about to fly. The outward and backward stretch generates heavenly Qi and the bending in prayer position activates Qi energy within the body. Stretching the crane flushes the blood throughout the body. You may find it difficult to maintain balance at first, but patience and perseverance will be rewarded, as this is one of the most effective stimulating the energy, blood circulation and loosening the body. 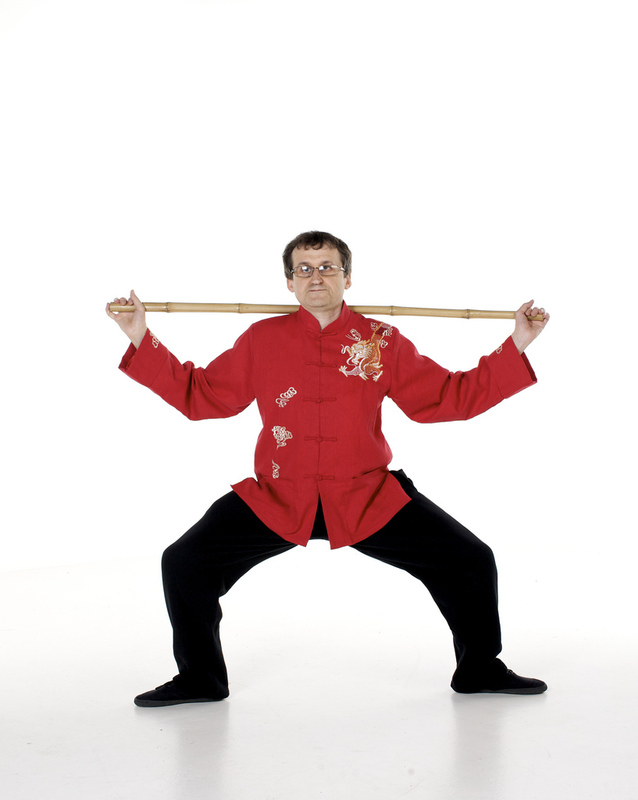 The Tai Chi posture `Snake Creeps Down’ (aka `Squatting Single Whip’) has the beneficial effect of opening the hip joints (called the `Kua’ in Chinese). The Kua is the connecting joint between our upper body and lower body, and the idea is to get our `energy’ or `Qi’ flowing through this area. Many Tai Chi instructors will attest that the Snake Creeps Down stance builds leg muscles and increases the general strength of the lower body, as it involves the waist, lower back, hips and inner sides. This posture can therefore help the middle section of the body (the `core’) to become looser, stronger and more powerful. However, because the posture is very difficult to perform, beginners need a qualified and experienced instructor to guide them and ensure that they have the correct alignment so they do not injure themselves. It requires the student to squat with most of the weight on one leg and there is a lot of ways that alignment, posture and balance can go awry. People with knee / hip / lower back problems in particular will need careful guidance and to approach this posture with caution. Approaching body fitness through Tai Chi is fine if you want to dedicate your life to the study of the martial art, but there are safer, more efficient and effective methods of opening the Kua and strengthening the core. 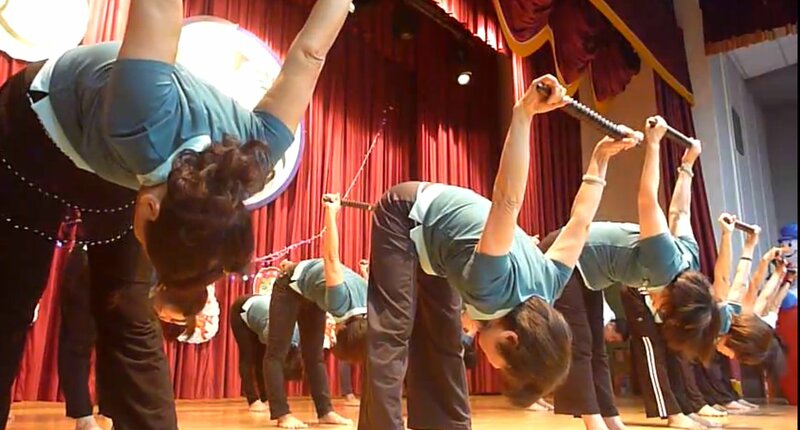 The Chinese Wand exercises has several postures that offer an effective and simple way of opening the kua and also engaging the core muscles and legs. 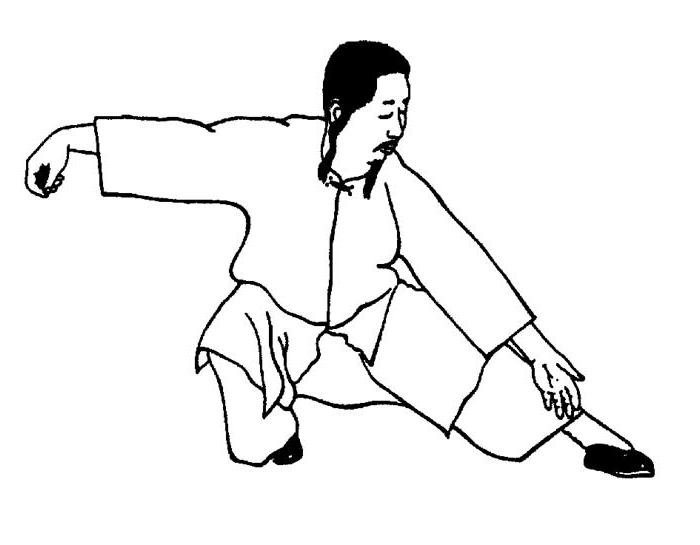 You can certainly open the kua with Tai Chi postures such as Snake Creeps Down. However, if exercise, not martial arts, is your reason for practice, then you can try more efficient methods.